Most of us can have nights where they have trouble sleeping, sometimes it is our thoughts that keep us awake. 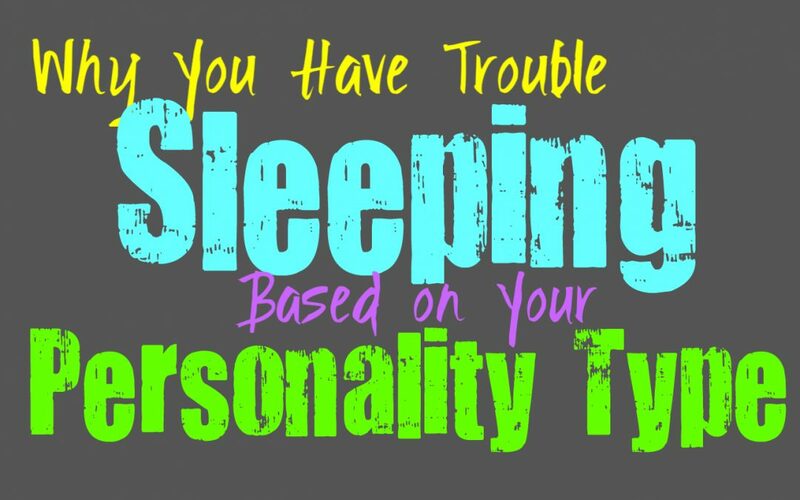 Here is the most likely reason you struggle with sleep, based on your personality type. INFJs often have trouble sleeping because their inner minds are filled with so many complex thoughts running around at once. Sometimes this is them experiencing doubts and feeling guilty about things they feel they have failed to do. INFJs can often be truly hard on themselves, and so sometimes these thoughts and feelings can keep them up at night. They can question their own actions and feelings, sometimes doing this all hours of the night. For the ENFJ struggling to sleep often comes from the long list of things they need to get done. They try to take care of everyone and at the same time have truly active inner minds. This causes the ENFJ to run through all of the things they need to get done, and this often keeps them from sleeping all that much at night. They find themselves staying up to accomplish tasks and sometimes rising early because their minds just won’t allow them to rest for very long. INFPs have extremely active and imaginative inner minds, and this is often the thing that keeps them up at night. They run through so many different ideas and scenarios inside of their heads, and this can keep their minds too active to rest. INFPs are often creative people, with so many different ideas and feelings and these things make it hard to really wind down when it is time to sleep. They can also find themselves worrying about things, either from the past or even the future. ENFPs have truly active inner minds, which are rich with thoughts and new ideas. They can sometimes become so caught up in something they are thinking about, that they completely lose track of time. ENFPs can spend hours researching new things, and diving into their own thoughts and feelings about it. Their imagination makes it challenging for them to really lay their minds to rest, and so sleeping can be truly difficult for them sometimes. INTJs are mentally active people who crave knowledge and this pursuit can make it difficult for them to really silence their minds. INTJs who struggle to sleep are often running through everything they have learned and are processing things in their own way. They also struggle to rest because they might be thinking about all of the things they would rather be doing than simply lying dormant. INTJs have rich inner minds which can keep them from being able to sleep when they need to. ENTJs have rather rich inner minds and constantly are trying to get things done. Their desire to get things done and focus on being efficient is often the exact thing that keeps them from being able to put their minds to rest. When they are trying to fall asleep the ENTJ will often be thinking about all of the things they need to get done the next day, and this can keep them from being able to really put their mind to rest. They also have active thoughts which are filled with so many facts and ideas that it becomes challenging to really find the ability to rest. INTPs have extremely active inner minds which can run through so many thoughts and ideas at the same time. This makes it rather difficult for the INTP to put their minds at rest when it is time to go to sleep. They find that is can be challenging to make themselves sleep when they want to, often because their minds control when they are truly ready to rest. The INTP is often thinking about so many different patterns and ideas that it becomes truly challenging to fall asleep and so they might give up trying completely and just continue researching or reading things on their phones. The inner mind of the ENTP is a place filled with so many different ideas, patterns and imaginative thoughts. This makes it difficult for them to really sleep when they want to, since their minds might have other plans. They will spend hours thinking through and processing everything they have learned, and trying to uncover the patterns within this information. This is something their minds do naturally, which makes it hard for the ENTP to really silence these thoughts. This inability to silence their inner minds is often what makes it challenging for them to sleep. ISTJs can sometimes struggle to put their minds to rest because they are running through everything they need to get done. They are hardworking and focused people who often run through lists of what they need to take care of. This can sometimes cause them to have a hard time resting because they are thinking about all of these important tasks. ISTJs can usually find a way to settle their minds, but there are times when their concerns can keep them up at night. For the ESTJ stress is often the biggest reason they struggle to rest their minds at night. They often find themselves thinking through everything they need to get done and this can make it difficult to sleep. ESTJs can be worriers at times, especially when they have a lot on their plate. They are often set to take care of their loved ones and provide for them and this puts a lot of pressure onto them. This pressure and stress can make it truly difficult for the ESTJ to sleep at night. For the ISFJ the biggest thing that often keeps them up at night, is their minds running through everything they need to get done. They also worry quite a bit about their loved ones, and this stress can make it challenging for them to really find sleep. ISFJs want to be there for their loved ones and they try hard to take care of them. This makes it really difficult for them to find rest when their minds are constantly running through everything they should be doing. For the ESFJ stress and worry can be the biggest reason they are struggling to fall asleep at night. They will be thinking about all of the things they need to get done and this causes them to overthink and struggle to fall asleep. ESFJs care a lot about their loved ones and so they work hard to provide for them and make them happy. The fact that they care so much about others is often the biggest reason they struggle to fall asleep at night, since they are often worried about providing for them. ISTPs might find themselves feeling a bit bored or antsy when they are getting ready to sleep. Distracted are often the biggest thing that makes it challenging for the ISTP to put their minds to rest. They might feel like there is something more interested like a TV show or a good book, and these things can keep them from falling asleep when they should. ESTPs have really active thoughts, but most of the time stress is what keeps them up at night. When they have a lot going on in their lives it can be challenging for them to really find the time to sleep. ESTPs also have a tendency to become bored easily, and sometimes this occurs when they are trying to rest. This makes it difficult for them to sleep when they are feeling antsy and want to find other things to occupy their time. For the ISFP it seems to be challenging to sleep when there are excited about something or having some big event on their minds. When they are thinking about something they want to do the next day it is truly challenging for them to put their minds at rest. They are eager people who find themselves become antsy when they are stuck in one place for too long, and this can be what causes them to stay up at night when they should be sleeping. Worrying about others and stressing about major life issues are often the biggest reasons the ESFP struggles to sleep. They care about their loved ones and sometimes their concern can make it difficult to really sleep. They might find themselves worried about their place in the lives of others, wondering if those people truly care. This makes it hard for the ESFP to sleep when their minds are considering all of the angles.